Finally, healthy oatmeal cookies recipe! It took me long time to find this healthy oatmeal cookies recipe. Week after week I baked oatmeal cookies - low fat, low carb, vegan, chewy, crisp - and could not find the one that would be reasonably healthy yet tasty like a cookie should taste. This was the only recipe that was unanimously approved by everyone in my family with an impatient demand to bake more. 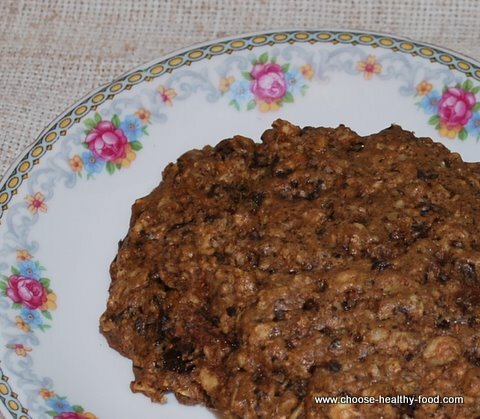 My recipe was inspired by Anna's amazing vegan chocolate oatmeal cookies that received raving reviews from so many people. I just replaced some ingredients with healthier substitutes and made minor changes that reduce bad calories. Enjoy! Combine oatmeal, sugar, spices and margarine the mixing bowl. Mix well. When margarine is evenly distributed, start adding almond milk. Add remaining ingredients (nuts, seeds, chocolate, dates, raisins) and mix well. Add baking soda and pour 1/2 teaspoon vinegar on it. You will see bubbles: immediately mix them into the dough thoroughly. Preheat the oven to 375 degrees.Lighly grease cookie sheets. Spoon cookies onto prepared sheets, keeping each cookie about 2'' apart. Cookies should be even height so that they bake evenly, so push a spoon in a middle of each cookie making it flat. Bake for 7-12 minutes, or until lightly golden. Let them cool on sheets for 2 minutes, then transfer to cooling rack or counter top. Enjoy! 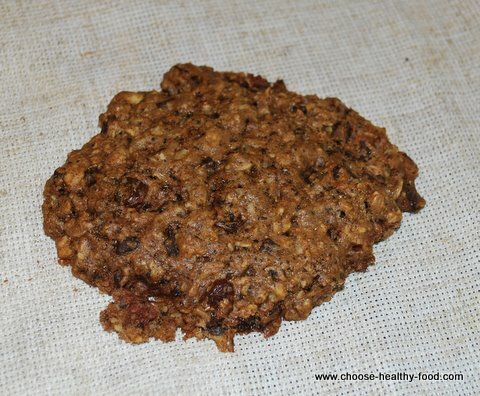 This healthy oarmeal cookies recipe makes 25 cookies, soft inside and crispy on the outside. Are homemade oatmeal cookies good for weight loss? Here is what I think: it depends on what cookie you choose to bake. If you put just as much sugar and fat int your cookies as a commercial baker did, there is no reason for you to expect that your own homemade cookie comes out better for weight loss than a commercially baked one. However, these healthy oatmeal cookies recipe will please your taste buds without breaking your weight loss diet if you eat it in moderation. It provides a long list of vitamins and minerals, and, more importantly, fiber and complex carbs. Complex carbs is what you need on a weight loss diet. It allows you to keep your hunger at the bay longer. Fat in this cookie is of healthier variety: non-hydrogenated, omega-3 and omega-6, polyunsaturated. This cookie doesn't have any cholesterol and very little Sodium. It contains more protein and scores more fiber, a spectrum of minerals, especially Manganese, Magnesium, Copper, Iron, Zinc, and a number of vitamins. So, in a nutshell, this cookie is like a meal replacement, more sustainable and satisfying than your regular oatmeal cookie. Hope you enjoy it!